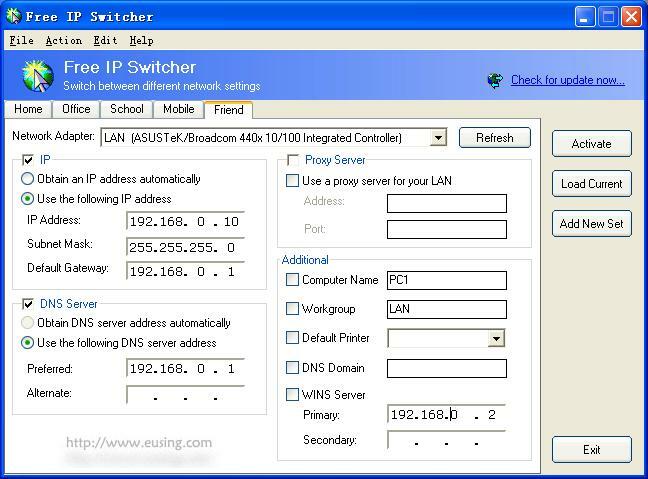 Free IP Switcher: Switch between different network settings - Spyware FREE. Whenever mobile user moves to different network, has to change particular IP address, gateway address, subnet mask, proxy server and default printer, etc., to particular network environment. In order to do it, he has to remember TCP/IP settings information of every network. Also, he has to reboot the computer to apply it to the system and to access the Internet. Don't waste your time reconfiguring computer network settings every time you change your location. Free IP Switcher is a perfect solution for you. It switches between preconfigured network settings with a single click and without any reboot. With Free IP Switcher you can automatically change all network settings on your pc: IP address, network masks, default gateway, DNS dedicated server, wins server, proxy settings, default printer and more. Free IP Switcher is a freeware product, this means that you can download and use it for free. Anyway we will appreciate contributions: we will use collected money to finance new development of Free IP Switcher.